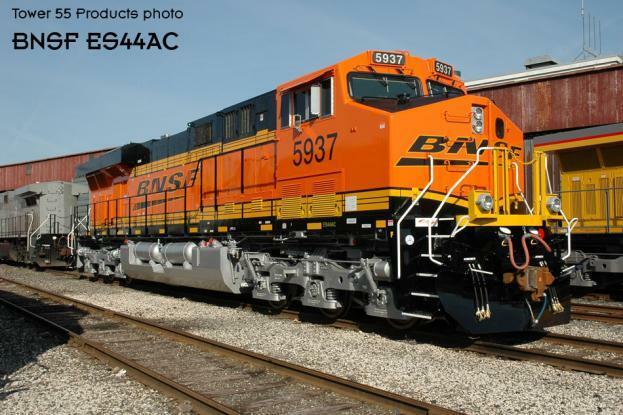 New run of BNSF ES44DC New Image scheme coming! Dear HO Modelers: Tower 55 has previously annouced plans for paint schemes called their "Classical Concept" series. These are classical paint schemes of famous popular images updated to Modern Locomotives. A "kind of the way we wish some of the engines looked" if our favorite paint scheme was available today. So here is a list of the three new offerings coming from Tower 55. We are sorry but there is no art work or images yet. But most of you will be familiar with the paint schmes and we are sure all of you have a little imagination. We will post images as soon as they become available from Tower 55. So enjoy. All models are fully painted, featuring crisp and accurate decals along with brass details such as handrails, hand grabs, snowplows, cut levers and air horns. Kadee #58 scale couplers are also applied to each unit. The models operate very smoothly and quietly. The extra attention to detail makes their appearance truly an outstanding model! Tower 55 Classic Concept GEVOs Have Arrived! If you primarily model a railroad that no longer exists due to railroad consolidations and you really want to add some modern power to your railroad, why not check out our Classic Concept series of locomotives. Take for example the Southern Pacific ?Black Widow? scheme?we applied this scheme to the UP GEVO locomotive since it was merged into the Union Pacific. We also took past NP and SF schemes and applied them to the BNSF ES44DC base locomotive. Each of these models feature all the details mentioned above. Road numbers are applied to the locomotives in sequence with other units in the same category, or in the case of NP we followed the numbering based on the horsepower rating and went with the 4400 series. Quantities are very limited with a total of 3 road numbers available for each paint scheme. Contact us today at (866) 840-7777 to place your order today. "We recognize that a few issues have come up regarding the operation of our DCC/ DC equipped locomotives. We are doing our utmost best to service each question, comment, and concerns on a case by case basis. Many of the concerns and frustrations customers are experiencing are due to our being new to the plastic model train industry and unanticipated issues with the electronics with our Explorer Series models. Some of the issues were simply caused by a miscommunication on our part that the Explorer series models (with DCC and sound) would work seamlessly in DC operation with sound and operation controls. The models do operate in both DC and DCC modes; however the sound is less than desired by customers. Digitrax is diligently working on a solution for these issues. Our intentions were honest for the Explorer Series; however we simply tried to do too much with all of the opinions we received and lost sight of our goal for smooth and simple operation. We are now more focused and have a clearer understanding of your expectations and our abilities to deliver specific products. Because of our lessons learned, beginning with the CP ES44AC and the newly announced BNSF ES44AC locomotives, we will have new boards for these locomotives that allow for smooth operation between DC and DCC. Further, Digitrax will also release a device for DC customers to control more than just the basic engine sound. Be sure to check with Digitrax for this product. All in all, we are doing our very best to listen to our customers concerns and comments. We welcome these comments and ask for your patience and understanding. Yes, we have a long history in the model train industry with our relationship with Overland Models; however, this is our first venture into the plastic model market. As well as our first foray into the DCC and sound markets. We, like most other folks, need to try things out and learn from those shortcomings in order to keep improving our product. We are quick to learn and hope that you, our customer will continue to support our product in the future." "It is with great regret that we have chosen to cancel the Union Pacific 3-Unit Gas Turbine project. Quite simply the project cost to create the molds and accurately detail all turbines is terribly expensive and incredibly complex, more so than we anticipated when the original announcement was made. In order to make these powerful and massive locomotives, it requires a number of mold changes so that we can accurately model the turbines with the proper air intakes, air horn placements, fuel tank sizes, side ladder placements, tender types and truck variations. Each mold change equates to tens of thousands of dollars. It has never been our intention to simply create one basic model and then apply 30 different numbers with no respect to detail variations. That logic greatly deviates from our modeling philosophy. Our desire is simply not to drag this project along for a number of years and have folks asking when it will ever be produced. We remain hopeful that we can revive this project sometime in the future. However, we cannot afford to make this sizeable investment at this day and time with the uncertainty of today?s market, high oil prices, and fluctuating foreign exchange rates. We believe it is in all of our best interests to cancel this project now. We hope and trust you, our valued customers, understand our decision. Our Tower 55 line is proving to be a successful venture for us and we hope to produce many more accurately detailed models to the market place."